A long, long time ago in the distant past when M was not yet in our lives I picked up a very pretty book called Vintage Crochet by Susan Cropper. This really is pretty book full of pretty things all beautifully photographed and would grace any well placed coffee table. As with many craft books I own, I admired this book but had so many other projects on the go that it sat waiting patiently on the shelf for quite some time. When I finally did start a project from this book, it was an ill fated attempt to make a toy rabbit named Syd. This was way back when I had plenty of crochet experience but little practice reading patterns coming as I do from the background of just 'wrap the yarn, stick it through a hole, wrap it again and pull it through' school of crochet as (very effectively) taught by my nan. So it was that Syd was one of my early attempts to follow a pattern. It all went horribly wrong. I couldn't make the pattern work. 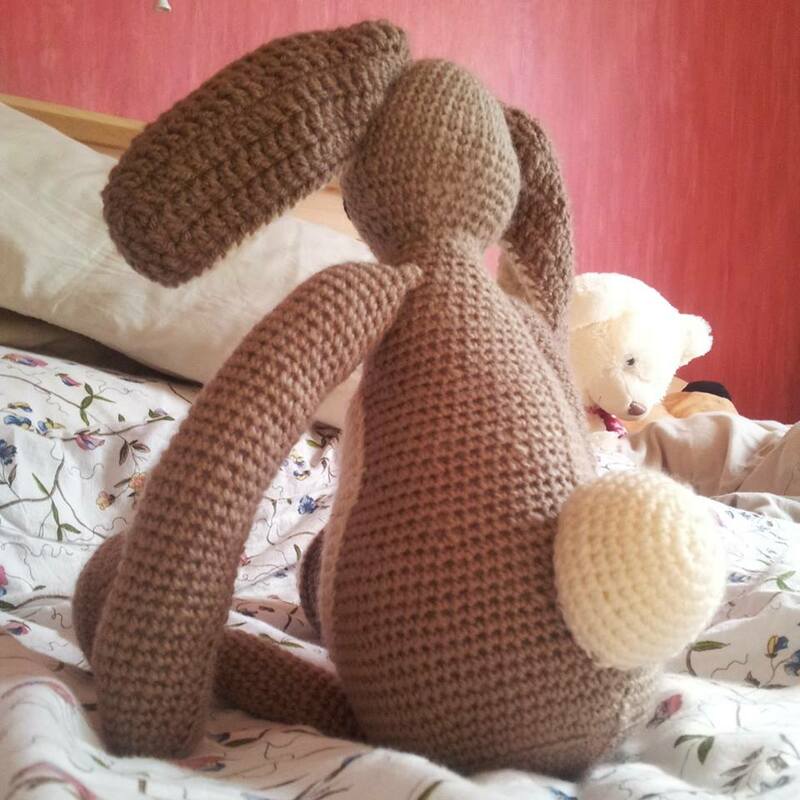 The instructions just seemed bizarre and no matter how I tried my rabbit looked wrong. Syd was the first project I cast into the frog pond and vowed never to go near the pattern (or book) again. M came along and in the fullness of time I started looking for a cute toy to make for my wonderful little girl. I remembered Syd and time dimmed my memories of the frustration of trying to follow that particular pattern. 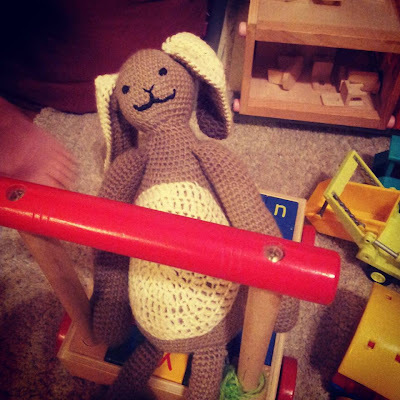 Syd the Rabbit was a lovely toy with a sort of timeless quality about it and so I decided to give the rabbit another go. Of course now things were a little different. I had followed other patterns and no longer felt the need to slavishly follow instructions which made no sense. The other big plus was other people had made the rabbit and I had the benefit of their notes via Ravelry. 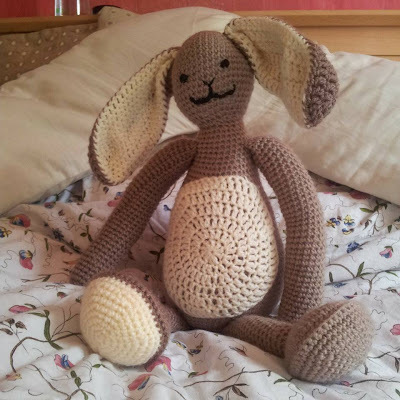 I read what other crocheters had to say and found I was not the only one to find this particular pattern difficult to follow, which really is a shame because Syd is not a complicated toy. The designer has her own way of writing out her pattern which I personally can't follow. This toy was never intended to be played with by a real toddler who is very hands on, in a pull or poke it to see what happens next kind of way. I decided the only sensible thing to do was to use the pattern as a guide and the inspiration, but to do my own thing. Six months later, the last two months of which the rabbit sat waiting for me to sew its face on, I can finally reveal my version of Syd, or Hop the Rabbit as M named her a few moments after the last stitch was placed. I didn't really keep track but was winging it the whole way. Worked in cheap acrylic on a 4mm hook, Hop is significantly bigger than Syd, achieved by adding in a few rows between decreases to give a longer body. I had to scale up the head, arms, legs and ears to match. The feet I completely changed because I didn't want to use triple triples because they would leave big holes my toddler could poke her fingers though. I decided against a pompom tail for similar reasons as M likes to pull things apart so I could see a pompom being very short lived. For the face I tacked in the rough position of the features then just did a tight satin stitch over the top in buttonhole (or top-stitch) thread. On reflection, were I to do it again (or for another toy) I'd use a contrasting yarn instead of thread as I think the effect would be neater as well as quicker to sew in place. M was delighted that the rabbit finally had a face, hovering close as I worked on the embroidery and even helping to pull a few stitches through. She decided this is a girl rabbit and named her Hop. 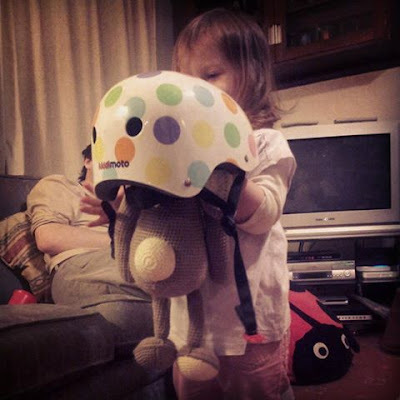 Hop was immediately put through her paces and prepared for her first scooter ride. Here she is riding on her 'scooter'. Now the project is complete I'm happy with the resulting toy. I do think the pattern is poorly written and if making this toy you need the errata (found here - including full pattern) before attempting to make Syd. Or just use the pictures in the book as your guide and have fun doing your own thing.